Trying to find a club event? Just look below for maps to the club meetings, observing site, and other places the OAC frequents. Club Meetings will be held at the DINOSAUR HILL NATURE PRESERVE, 333 North Hill Circle in Rochester. The building is tucked away in a residential area just West of Rochester Road (Main Street) and South of Tienken. The OAC Observing Site is at Addison Oaks County Park which is located off of W. Romeo Road (about 5 miles north of Rochester, MI). If you need detailed directions to Addison Oaks, here's the Yahoo map to the park. Once you get to the park, Yahoo isn't helpful anymore. The observing site is tucked away in a corner of a large field, accessable only by utility roads and trails. Tell the guard at the contact station that you're going back to the OAC observing site, you won't have to pay for park entry. Here's a map of the trail back to the site - just follow the dots! The OAC puts on and attends events at various places in Southeast Michigan. Here's a list of the most frequent event sites and their locations, organized alphabetically. 3071 Grange Hall Rd, Ortonville.Astronomy programs and stargazing. Yahoo map to Camp Narrin. Holdridge Rd, Holly.Astronomy programs and stargazing for Hazel Park School District. Take I-75 North to Grange-Hall Rd, exit 101. Exit to Grange-Hall and take it East to Dixie Highway (State Police/EMS unit on corner). Turn North on Dixie (left) and proceed just past Mt. Holly and the Hadley Cemetery to Holdridge Rd. (there's a small party store on the left side of Dixie). Take Holdridge Rd. almost to the end (it dead ends at I-75 and makes a turn around). Hazel Woods is located on the right side and is the last property before the dead end. You can drive up through the iron gate to the pavillion area to park. Yahoo map to Hazel Woods. 9501 Sashabaw, Clarkston. Quarterly star parties for park patrons. Star parties are held at the Lewis E. Wint Nature Center in the park. Just follow the "Nature Center" signs on the park road. Yahoo map to Independence Oaks. 895 N. Lake Angelus Rd., Lake Angelus. Historic solar observatory currently under renovation and restoration. Open 12:00PM-4:00PM every Sunday. Yahoo map to McMath-Hulbert. 3500 Dutton, Rochester Hills. School astronomy programs and adult enrichment classes. Yahoo map to Musson Elementary. 312 Woodward, Rochester. Programs and stargazing for OPC patrons. Yahoo map to the OPC. 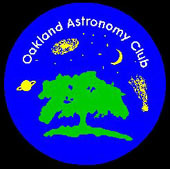 All information © Oakland Astronomy Club, Inc. unless otherwise noted.